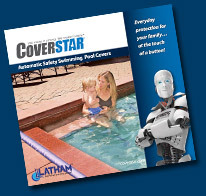 WE ARE A PROUD PROVIDER OF COVERSTAR AUTOMATIC COVERS! Automatic Pool safety covers require routine inspection to insure carefree operation and avoid costly repairs. We offer service on COVERPOOLS, Automatic Pool Covers, AQUAMATIC and POOL COVER SPECIALIST. Including replacing broken ropes and motors. Adjust cover operation, Flush dirt from the tracks, tighten all loose screws and fasteners, Lubricate all pulleys and fittings and provide a written cover inspection report. Clean Pool Cover with specially formulated UVL Cleaner and Protectant, Clean leaves and debris from the cover pump and housing. Comprehensive System Tune-Up and Cover Cleaning. *Additional travel charges may apply depending on your zone location. Replacement cover cost is based on the square footage of the cover. We also include our BASIC SYSTEM TUNE-UP as part of our AUTOMATIC SAFETY COVER REPLACEMENT. We use incredibly strong and durable fabric from COVERSTAR. Advanced vinyl formulation and superior fabrication methods are used in in Coverstar fabric. Only cover fabric which has been tested and certified by American Standard for Testing and Material (ASTM) is used for Coverstar fabrics. Where other manufacturers sew webbing material wrapped around rope to the cover. With this method the webbing often fails before the cover. COVERSTAR uses an exclusive patented process to heat seal webbing around a polymer bead and weld it to the cover in one step. This process produces a substantially stronger cover, longer webbing life and improved cover operation. AUTOMATIC POOL COVERS COMPLETE also sells and installs SWIMMING POOL SAFETY COVERS BY Coverstar. All of our Solid & Mesh safety cover seams are interlocked and double overlapped. This seam is the heart of the safety difference. Place your hands over top of one another – how strong is that? Now hook your fingers together and place someone else’s hands above and below your own – this is how our safety cover seams are done. Specially formulated heavy-duty vinyl fabric utilizes extruded coating process and closed polyester weave for superior product performance.